You won’t want to rush Kyoto. Japan’s cultural capital deserves all the time you can give it. But how to keep your accommodation bills down as you take in Kyoto’s sights? 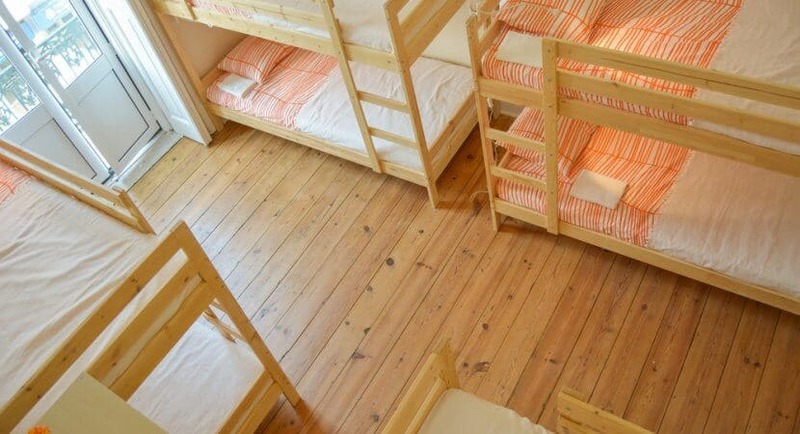 These ten hostels offer cheap accommodation right in the heart of Kyoto. All are clean, safe and secure—Japan’s hostels are a rightly ranked among the best in the world. Add in friendly, well-informed staff, a relaxed atmosphere, and social opportunities with an international bent, and you’ll see why the guests at these hostels keep coming back for more. J-Hoppers Kyoto has been in business since 2002, making it the oldest hostel in Kyoto. J-Hoppers staff are experienced at welcoming foreign travelers and tend to be young, well-traveled and friendly. All rates listed are per person, per night at normal rates unless otherwise listed. Prices increase during peak season. *Note: The dorm room beds have privacy curtains, which makes a big difference to being able to sleep. Credit cards are accepted and you can book online. Make sure you book in advance. Because J-Hoppers is so well known, it’s often fully booked months in advance, especially during peak tourist season. J-Hoppers is in a great location. It’s an 8-minute walk from Kyoto Station. Right outside the hostel is a bus stop that goes to some of Kyoto’s major attractions, including Kiyomizudera and Kinkakuji. Kujo subway station is just a block away. The common kitchen is well stocked with cooking equipment, but you may struggle to find fridge space for your food. On the downside, there is no elevator, which can be a real inconvenience in this 5-story building. J-Hoppers is a hostel chain that has its own stamp card. Every night you spend at a J-Hoppers hostel allows you to collect which you can spend on a discount on the cost of your accommodation, snacks or souvenirs. K’s House is one of the best hostels in Kyoto for a reason. An established hostel with a great reputation, K’s House won the award for the best hostel in Japan and Asia in 2013. The rooms and common areas are more spacious than usual for hostels, and the decor has a new, modern feel to it. Its recently refurbished bar comes complete with a skilled bartender, but most of the socializing happens in the common lounge. All rates listed are per person, per night at normal rates unless otherwise listed. Prices increase during peak season. Female only dormitory rooms with 4 – 6 beds are available. Get in contact with the hostel if you want to reserve one. *Note: If staying in a dorm, be aware that there are no privacy curtains on the beds, so your quality of sleep depends on the thoughtfulness of your roommates. Credit cards are accepted, and online booking is available. Their website is up-to-date, and the reception desk open from 7:00am – 3:00am. However, the check-in time is from 3:00pm – 11:00pm. A 9-minute walk from Kyoto Station, K’s House Kyoto is a little farther than other hostels, but makes up for it by being close to convenience stores, a supermarket, and even a public bath. It’s only a 20-minute walk from the hostel to the Gion district, where menu Kyoto attractions, restaurants and bars are located. It’s also a short four-minute walk from the Shichijo Subway Station. Hana Hostel describes itself as a budget ryokan, and it definitely manages to combine hostel amenities with distinctly Japanese hospitality. Hana hostel opened in 2010 in what was formerly a ryokan, a Japanese style hotel. The private rooms are all tatami, meaning you sleep on futons. The dorm rooms are bunk beds with curtains. This is one of the best hostels in Kyoto because it is family and elder-friendly, and attracts a good number of Japanese guests. The common room/kitchen space is an excellent place to make new friends with Japanese people curious about international travelers. *Note: A 300 yen surcharge applies to all these prices during high demand periods. It can be noisy, but the staff provides earplugs free of charge. Hana Hostel is a 5-minute walk from Kyoto Station, and 3 minutes to the nearest supermarket. It’s part of the J-Hoppers chain, and uses the same stamp-card system that J-Hoppers do. If continuing on to a Hana Hostel or J-Hoppers elsewhere in Japan, keep hold of the card they give you on check-in to earn a reward. Khaosan opened their first hostel in Tokyo 2004, and have since expanded to become the biggest hostel chain in Japan, with a total of 13 hostels. They’re known for quirky design and traveler orientated amenities, but the Khaosan Kyoto Guesthouse is bare bones. The dorm room beds have privacy curtains, which makes a big difference to being able to sleep. The Kyoto hostel is located on the edge of the Gion district, which is a 3-minute walk from Hankyu Kawaramachi Station. This is inconvenient if you’re traveling on the JR lines, since you have to transfer to either the Keihan lines or the subway, taking a bus or a taxi. If you’re traveling from Osaka or Kobe, you can take the Hankyu line for the entire trip. Once you’re there, the hostel’s location has definite advantages. It’s walking distance to Yasaka shrine, Nishiki Market, Kiyomizudera, and Gion, the entertainment district famous for geisha. Being so close means you can enjoy these popular areas before the crowds of tourists arrive. Prices vary widely depending on demand. The Lower East Nine Hostel is a new addition to Kyoto’s hostel scene, but it’s chic style, quality cafe and bar are already earning it a reputation. Their cafe & bar is open from 8:00am – 11:00pm and serves hostel guests and friendly residents, making it an excellent meeting place. The cafe employs free baristas, and you receive a free coffee with your breakfast. The staff includes locals and native-English speakers, all of whom can help with sightseeing tips, arranging transport and making bookings. All rates listed are per person, per night at normal rates unless otherwise listed. The dorm room beds all come with a privacy curtain. An 8-minute walk from Kyoto Station or 2-minute walk from Kujo Subway Station, LE9 describes itself as “Kyoto’s front door.” Although not located near any sights, its proximity to Kyoto’s transport networks does make it an excellent base to travel from. Khaosan’s love of quirky design comes through in their second Kyoto location, with Kyoto Theater featuring “kimono beds,”bunk beds with curtains made from recycled kimono fabric and traditional art on the walls. All beds at the Kyoto Theater are dorm beds, with a choice between the colorful dorms or the deluxe kimono bed dorms. While the decor is the hostel’s main selling point, it also features a multi-purpose library with a common balcony area where guests can enjoy the sun. Located near Nishiki Market, Khaosan Kyoto Theater is close to the Gion district and its myriad attractions, and only a 5-minute walk from Kawaramachi Station on the Hankyu line. This small hostel is located within a 100-year-old former private residence. Although recently renovated, the wooden building retains its unique atmosphere and charms. Owners Taka and Yuka Oki go out of their way to make guests feel at home. Adding to the hostel’s homey atmosphere are the three resident cats. All rates listed are per room, per night at normal rates unless otherwise listed. *Note: If renting the whole house, the owners, Taka and Yuka stay on property in the staff room. Oki’s Inn is within walking distance of Gion, Kiyomizudera, and the Heian Jingu shrine. It’s a 15-20 minute subway ride from Kyoto Station, a short walk from the KarasumaOike subway station. There are convenience stores nearby. For fans of Japanese manga or anyone who has ever wanted to sleep in a bookstore, ComiCap combines elements of the Japanese Manga Cafe with a Capsule hotel. The comic fusion relaxation space has 30,000 comics, and comfortable seats where you can relax while reading them. While not a true hostel, it is a good mix of a capsule hotel, late night lounge, and modern hostel all in one. The capsule style beds are built into the bookcases and include a privacy curtain and a reading light, so you can read as late as you like without worrying about disturbing anyone. The prices drastically change during their peak times of operation. Tip: There are usually discounts for this hostel when you book online. ComiCap is a 5-minute walk from Kawaramachi Subway Station. It’s walking distance from Gion district, Nishiki market, and a host of other attractions, including the Kyoto International Manga Museum, which, if you’re staying at ComiCap, will be right up your alley. Describing itself as an integrated cafe-bar and hostel, Len aims to be a gathering place for all people. The first floor is a beautifully designed lounge area, open to hostel guests and those wishing to use the cafe. The cafe is open from 8:00am -5:00pm, and serves breakfast options. At 5:00pm it transforms into a bar. There’s also more substantial food options on the dinner menu, available from 5:00pm -10:00pm. The common-kitchen is available for guests staying at the hostel, and there is also a library with two computers that can be used by guests. Len is a short walk from two nearby bus stops. It’s a 7-minute walk from the Hankyu Kawaramachi Station, or the Shijo Subway Station. If arriving from Kyoto Station, it’s recommended you take the bus or taxi as getting there by train is difficult. Once there, you’re in an excellent position to explore the surrounding Gion area, or stroll the banks of the Kamo River. An informal hostel located close to Kyoto station, Mosaic is a friendly way to experience Kyoto. This is on our list for one of the best hostels in Kyoto because of its emphasis on socializing. Together with the bi-lingual staff, frequent social events, and cultural exchange opportunities, you’ll find plenty of opportunities to meet people here. The rooftop terrace allows you to take in views of downtown Kyoto from a hammock, and the cafe & bar and common room areas are both open 24/7. The common room has two computers that are free for guests to use. Although called dorms, these are more accurately described as capsules and come with privacy screen, reading light, electric sockets and storage. Mosaic Hostel is a 6-minute walk from Kyoto Station, and is well served by the city’s transport options. There’s an AEON mall a 5-minute walk away and a convenience store nearby. Whichever one of these hostels you stay in, you’re guaranteed a memorable trip—for all the right reasons. While the accommodation might be budget, the friendliness of the staff and their willingness to go the extra mile in helping you get the most out of your time in Kyoto is definitely five-stars. What did you think of our 10 best hostels in Kyoto list? Have you stayed at an hostels in Kyoto? If you have any recommendations, let us know in the comments below!